The Indian Rupee hit its all time low of Rs 68.86 against the USD. This fall, unlike 2013, came in the wake of the global factors like the rise in US bond yields and surge in the US Dollar. However, both these factors are weighing in on the emerging market currencies across the board. Also, expectations that President-elect Trump will pursue an expansionary fiscal policy and drive inflation higher leading to higher US interest rates are behind rise in US yields that have attracted investors to the dollar. In 2013, the Indian rupee, along with the currencies of fundamentally weak economies, had seen a steeper sell-off compared to many other currencies. This time, the rupee’s performance is better than many other emerging market peers. The concern, however, is the narrowing differential between U.S. and Indian bond yields. The U.S. 10 year bond yields have surged from 1.82% in beginning of November to 2.32% recently ahead of the expected rate hike from the Fed. Indian 10 year bond yields have plunged from 6.821% in beginning of November to 6.326% recently. A narrower differential in yields makes it less attractive for foreign investors to invest in Indian government bonds. This is reflected in the Rs 16,154 Cr outflows from the Indian debt markets so far this month. This has led to an evident pressure on the global currencies, especially the emerging markets. When compared to individual emerging market currencies, the appreciation has been even more dramatic; although foreign investors are pulling money away from Indian bonds India's strong economic growth should sustain investor interest in equities. The depreciation in the Rupee can have a long term as well as momentary implications on our domestic economy. The above chart shows the recent surge in dollar strength that led to Rupee depreciation. If the depreciation of rupee continues, it will increase the inflation. Thus, RBI will have very less room to cut policy rates. No cut in policy rate will add to the borrower’s agony. On the contrary, if the RBI still cuts interest rates the Interest Rate Arbitrage between India and US becomes less attractive leading to higher capital outflow. Years of low-interest-rate policies from the Fed have encouraged companies in these fast-growing economies to borrow dollars because they could do it more cheaply than if they took out loans in their local currencies, like the Indian rupee. The interest burden would increase on foreign currency denominated debt. 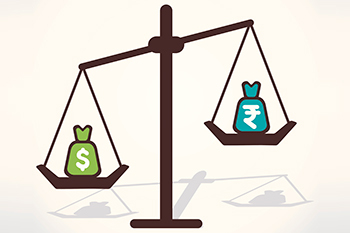 For companies that have availed foreign currency loans for implementation of projects, the rupee depreciation will stretch their balance sheets. As the value of the dollar rises, the companies will need more of their local currency to pay back the dollars that have since then gained in value. Our equity markets have been volatile for some time now mostly led by the FII flows. Even though they have brought in record inflows of dollar in recent times, chances are they may be thinking of taking their money out of the Indian equity market, which might again results in less inflow of dollars in India. Importers will strongly feel the pinch of falling rupee as they will be forced to pay more rupees on importing products. Conversely, a feeble rupee will bring delight to the exporters as goods exported abroad will fetch dollars which in return will translate into more rupees. Foreign travel and education will become costlier. The expenses incurred towards university fees as well as the cost of living financed through domestic avenues will put huge burden on the students. A weak rupee will increase the burden of Oil Marketing Companies (OMCs) and this will surely be passed on to the consumers as the companies are allowed to do so following deregulation of petrol and partial deregulation of diesel. If the OMCs increase fuel prices, there will be a substantial increase in overall cost of transportation which will stoke up inflation. The rupee depreciation will provide a boost to both NRIs and developers who are planning to invest in India. This is because they find it cheaper to invest in Indian real estate as they will have more money to invest in the local markets and developers concentrate their marketing efforts to attract more NRIs. It will be positive for the IT industry in the short-term, as the foreign investments in the industry will increase and making them more cost-competitive. In the long run depreciation in currency fuels inflation, affects market sentiments and it will affect signing of new contracts by domestic IT firms. However, IT sector is facing its own set of problems which may act as a head wind. While domestic business oriented companies may remain largely tranquil by the declining rupee, yet they too may find the inflationary impact in their business. Also, companies using domestic input and exporting most of output will gain the most from rupee depreciation.